The City-Gates “INSULATOR DOOR” is the most efficient insulated door available in today’s market. 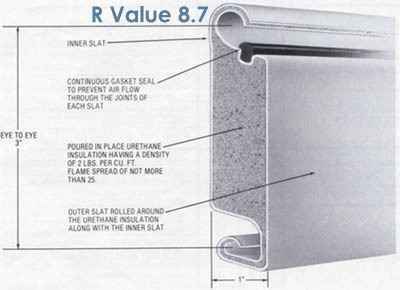 Many STANDARD features of the “INSULATOR”, such as a continuous gasket seal between each slat, 22 gauge interior and exterior slats, prime paint, and a choice of either a header or internal hood baffle, are not available even at a premium cost from other manufacturers. Furnish insulator doors as manufactured by City-Gates. Material and workmanship shall be guaranteed for one year. Product installation is to conform to City-Gates standards.asp-pin type for use with padlocks. (Padlocks not furnished.) Slide bolts optional. 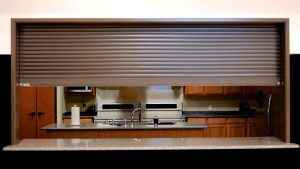 Insulator door curtains formed from interlocking 22 gauge galvanized steel insulated roll formed laminated sections. These sections are composed of two prime painted steel slats simultaneously formed with poured in place urethane foam insulation, to produce a laminated section, free of voids. A continuous rubber gasket seal is incorporated in each section during the roll forming process. This gasket creates a continuous seal between each slat which is derived through the vertical pressure created by the door curtain. Each section of the curtain shall have continuous end locks. The curtain design shall be such to provide a 20 pound per square foot galvanized or prime painted steel. 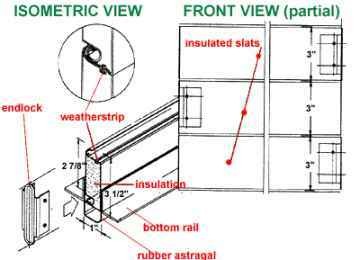 Additional weather-stripping such as astragal, guide weather-stripping and a header or hood baffle are included as standard. 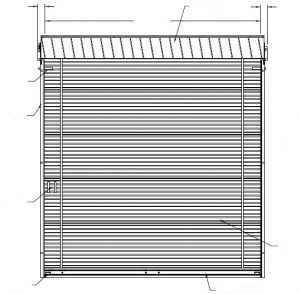 Vision panels composed of double glazed lites contained in fully insulated slat sections, and motor operation are available as options. 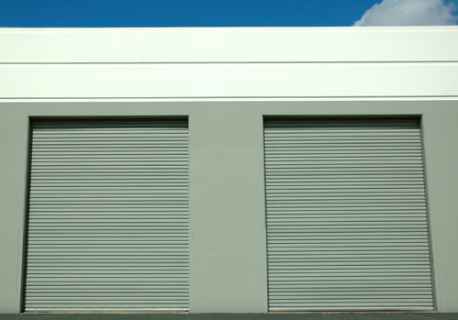 All other components of insulated doors shall be the City-Gates standard design. Steel pipe barrel of size capable of carrying curtain load with maximum deflection of 0.03″ per ft. of door width. Heat treated helical torsion springs encased in a steel pipe and designed to include an overload factor of 25% to ensure minimum effort to operate. Sealed and pre-lubricated ball bearings at rotating support points. A charge wheel for applying initial spring torque and for future adjustment. Also available in stainless steel or hot dipped galvanized. High Cycle Springs designed to satisfy 30, 40, 50, 60, 70, 80, and 90m life cycles. Extra high cycle, 100m and up consult Engineering. (Square or Round Optional) #24 gauge galvanized steel. Formed to fit contour of brackets. Intermediate supports as required to prevent excessive sag. Also available in stainless steel. 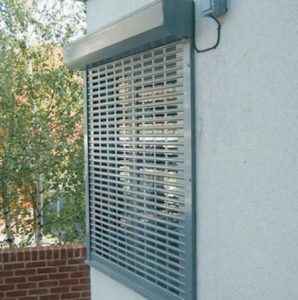 Guides are designed using structural steel angles with a minimum thickness of 3/16″, expansion slotted connections, and removable bellmount curtain stops to allow for curtain maintenance without removal of guides. Bellmount stops shall be flush with guide groove. Equip doors for latching by slide bolts. 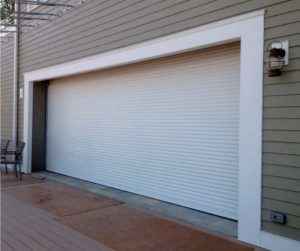 Motor doors with locks will void the Guarantee. (Optional) Finish on steel to be shop coated primer, except on galvanized surfaces (on stainless steel, #2B, #4B, #7B polished or mill finish). Call for color options and finishes. 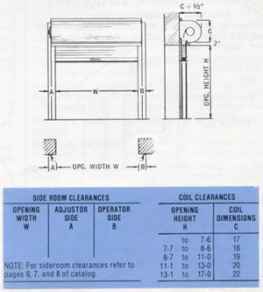 The curtain jamb guides will meet ASTM A-36 and ASTM A-123 specifications. The curtain will comply with ASTM E 84 specifications. The hood will comply with ASTM A-653. The electric door operators will comply with NFPA 70. 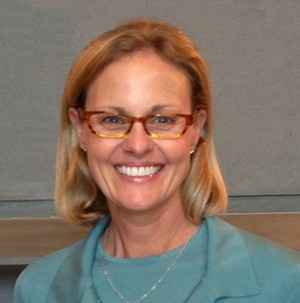 *Conforms to and with all applicable ASTM Testing Methods.